Before we delve too far into this particular blog, I need to remind you, the gentle reader, these thoughts and viewpoints come from a male of the species; one with, what seem to now be, outdated ideas of roles and responsibilities of people in society. So, let’s talk about…baths! For me, the word bath brings to mind images of a serene setting of bubbles, soft lighting and a claw-footed porcelain tub standing alone in an impossibly large bathroom. And, who’s in the tub? A woman. If I spend a little more time fleshing out my thoughts, I can also picture parents giving their young children baths before bedtime, giggling and creating long soap beards and wild hairdos. But, a man sitting alone, relaxing in a tub? Doesn’t really run in my slideshow. Look, I can’t explain why. Like I said, I’m probably just hopelessly outdated in my expectations of the roles of the male in society. But, I’m here to tell you – man, woman and child – baths have real healing powers! Recently, our house was struck down with the plague (Ok, it was the flu. It just felt much worse. ), and Joan was fervent in her use of a hot bath to feel better. She would run a bath, add Epsom salts, baking soda, and 3-4 drops each of lavender and Immunity essential oils, then soak and let the toxins get leached out. She had our daughter doing it on a regular basis, too. Me? I figured laying on the floor, watching bad Netflix documentaries, and hoping for a quick death had always worked for me, so why change now? But, I finally gave in and… wow! The aches were much less, I could breathe a little better and I drifted off to sleep much more quickly than I normally would with a fever. Now, over the course of this epidemic flu, I’ve been taking these medicated baths on a daily basis. They truly help! They’re natural. They’re calming. They’re helping me get back to being a male again. Give it a try, gents! 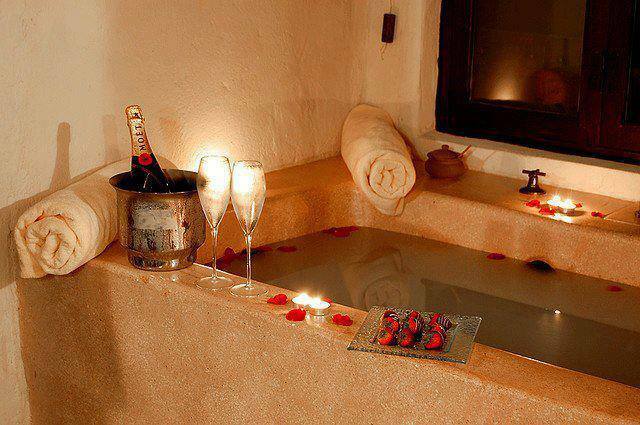 And, even when you’re not sick, try the relationship healing properties of a hot bath with lavender with your partner! One final thought on baths…when Michael Phelps takes a bath, is it relaxing or does it just feel like he’s at work?